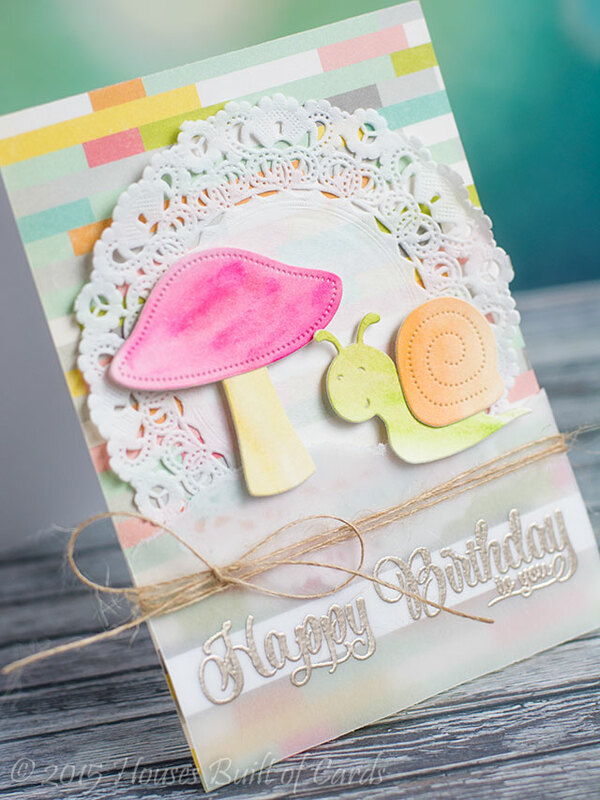 I used a bunch of fun Mama Elephant goodies on this card - starting with Landscape Trio dies to use as a mask to ink up the background with MFT dye ink. 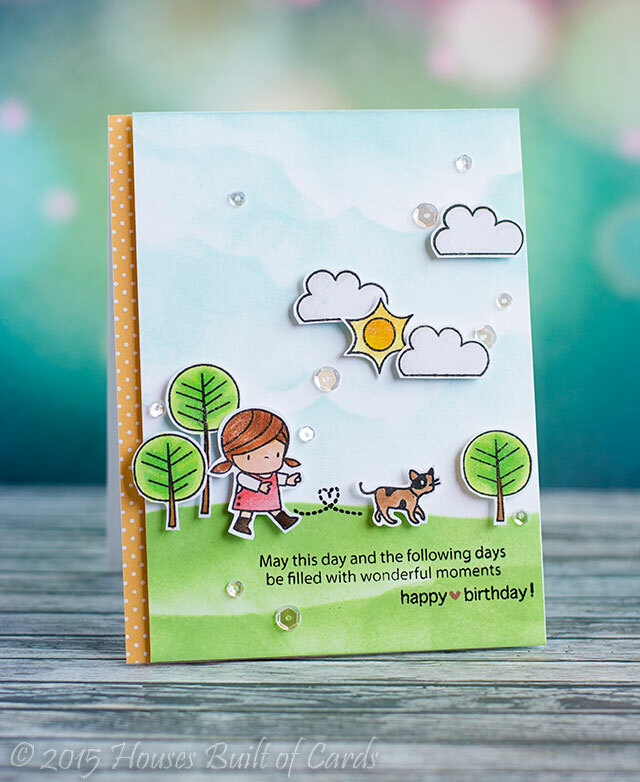 I used Sunday Stroll to create the scene, and built the cute sentiment from Sunday Sentiments and Three Amigos. Lots of foam dimension for adhesive, and strip of Lawn Fawn pattern paper on the side, and lots of sparkling clear sequins from Pretty Pink Posh to add a fun finishing touch! Also linking up with a couple other challenges - first up, the Mama Elephant June Challenge - White Space. Thanks for stopping by to visit! Have a great day!!! Glad we met - some happy news! 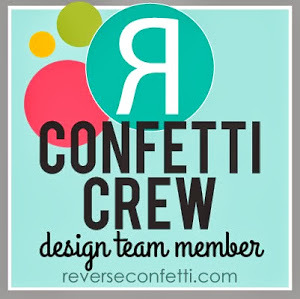 Yep - I was super excited a little while back to get an email from Savanna asking me to join the Paper Smooches SPARKS Design Team! I served a term a while back and LOVED it! 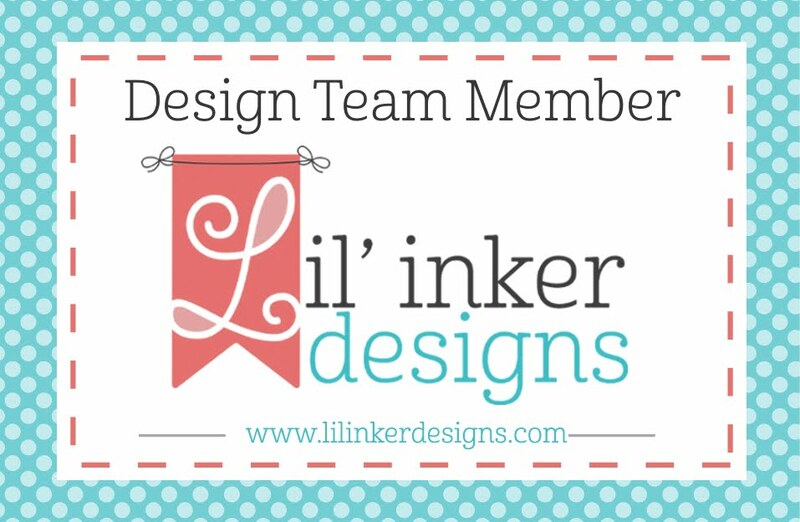 Such a fun team, and I love Paper Smooches stamps, so of course I jumped at the opportunity! So...even though it's only been online, I made this little card to celebrate "meeting" all the wonderful members of the team! 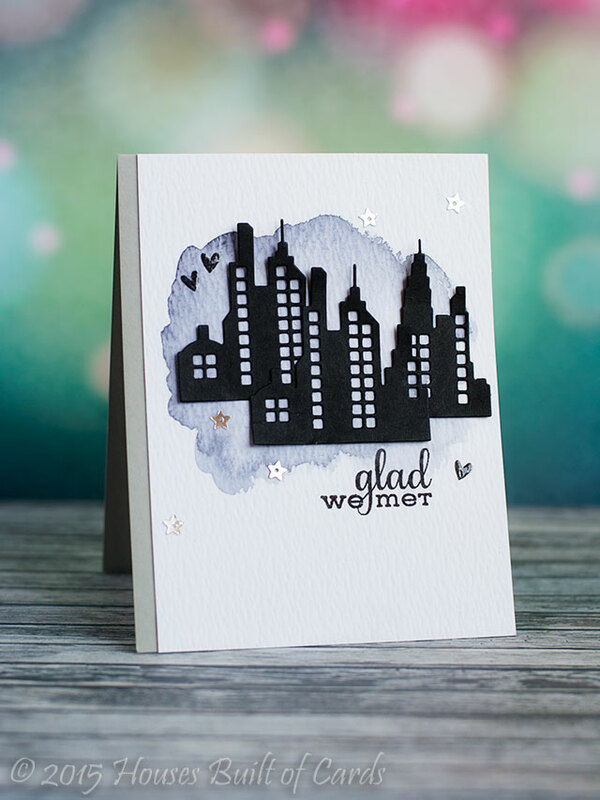 A little watercolor paired up with Super 2 Dies and Lovely Thoughts stamp set for the sentiment, and a few sequin stars from Pretty Pink posh to finish it off. 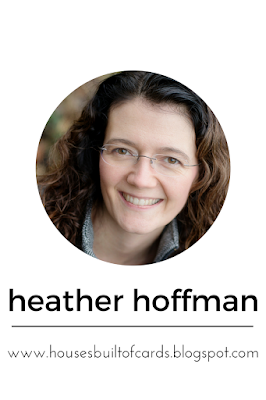 Thanks for stopping by and letting me share my happy news! Have a wonderful day!!! Good Sunday morning! 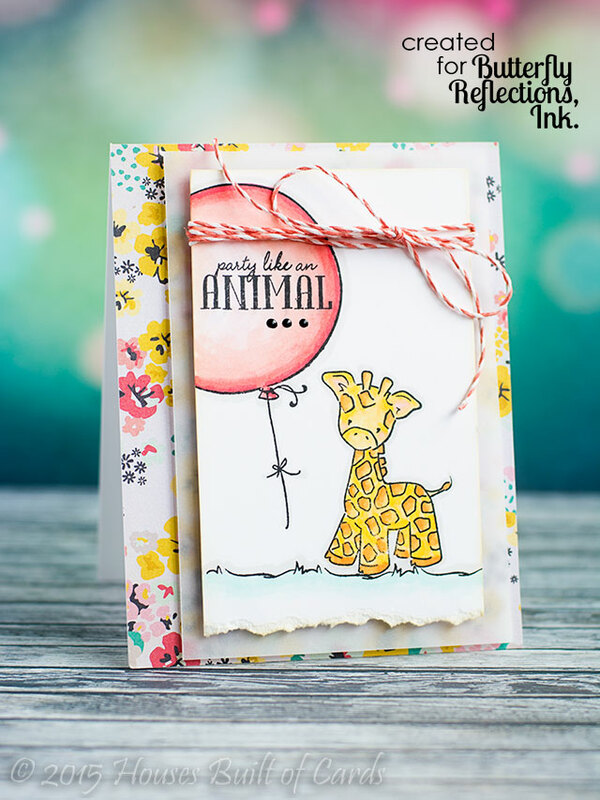 There is a new Stamp of the Week at Unity Stamp Company - and this is definitely a cute one! The day I made this, for some reason my crafty creativity just wasn't working with me. Doesn't happen very often, but when it does it always seems horrible! Took me a couple hours to make this (and two of them ended up in the trash - after being shredded a bit violently in my frustration!) Anyway - I was happy to finally be able to make something I was happy with - a little Copic coloring, some foam adhesive and dimension, a bit of Mister Huey's white mist, and a few silver star sequins from Pretty Pink Posh to finish it off. In case you haven't heart about the Stamp of the Week from Unity - for $5.79 a week (which includes shipping!) - you get a new and exclusive stamp set delivered to you. A little bit of happy in the mail every week! Here is the stamp set - darling isn't it? Thanks for stopping by today! I hope you'll stop by and check this out, as well as all the other new releases and fabulous sales going on this weekend! Have a great Sunday! 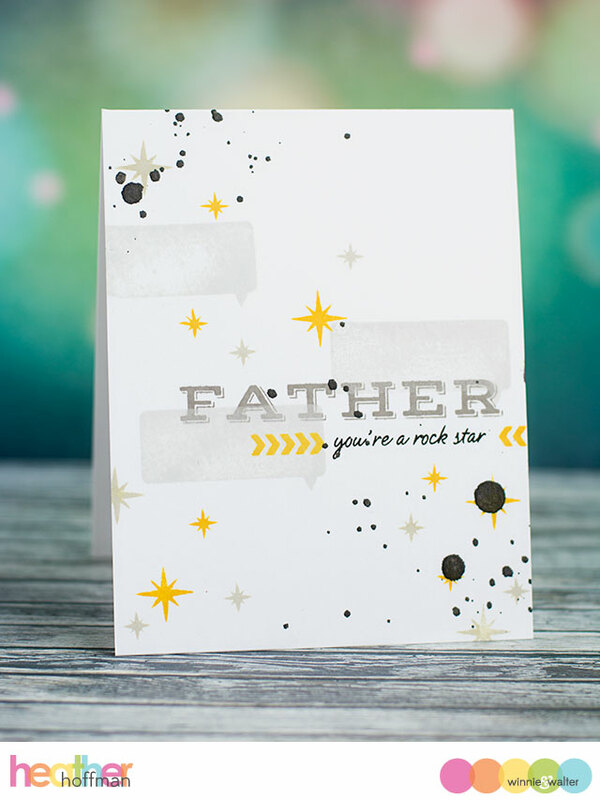 Overlaid Embossing Technique - with 1 Minute Video! Good afternoon! Stopping by to share a video I just finished - first one I've tried in about I year I think! Definitely need to keep working on it and have lots to learn, but had to try! It is just a minute long, and I would love it if you would check it out and let me know what you think? 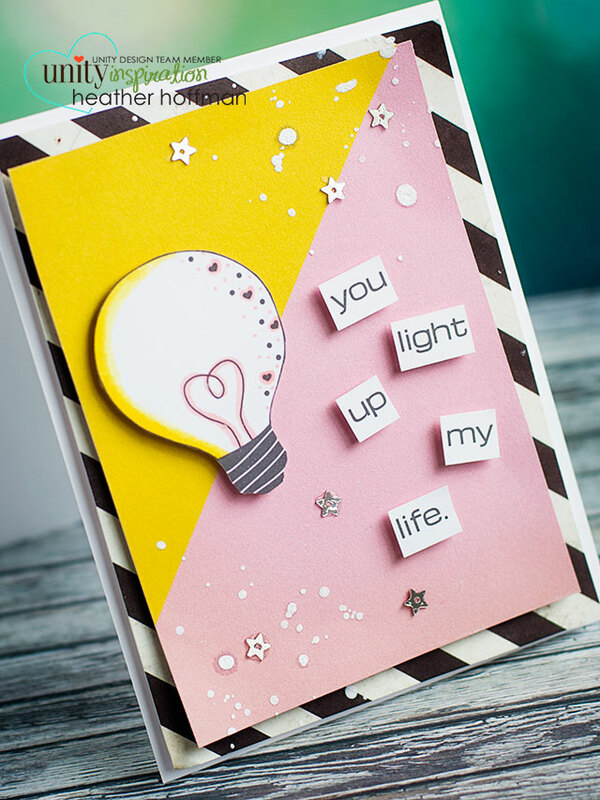 Here is a close up of the card I made in the video - plus another very similar one. 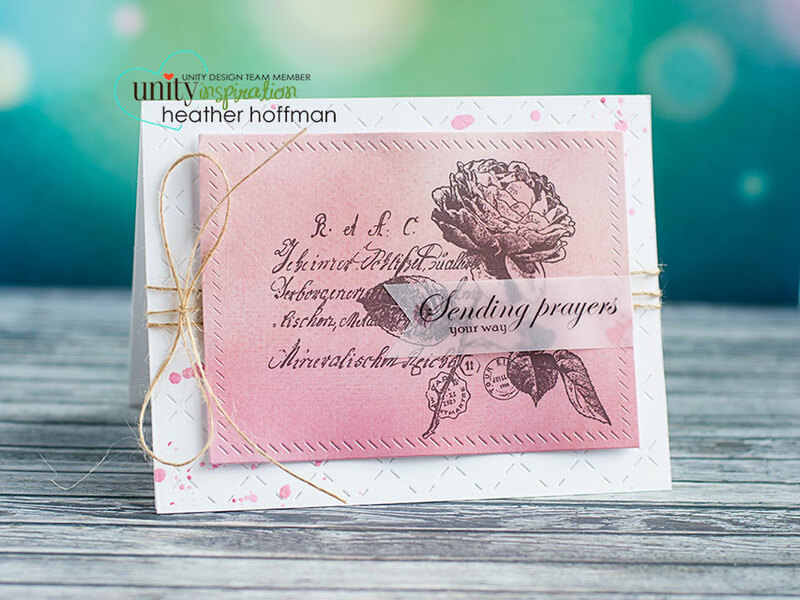 I used two Unity Stamp sets - Donna Peony and Everything Wonderful - with the BOGO sale this weekend, you could get pick up one of these, and get the other one for FREE!!! Very hard to see in the photos - the embossing made it hard to get a good photo! Sorry about that! Here are the sales for the weekend - great deals on everything! The first ever like it! 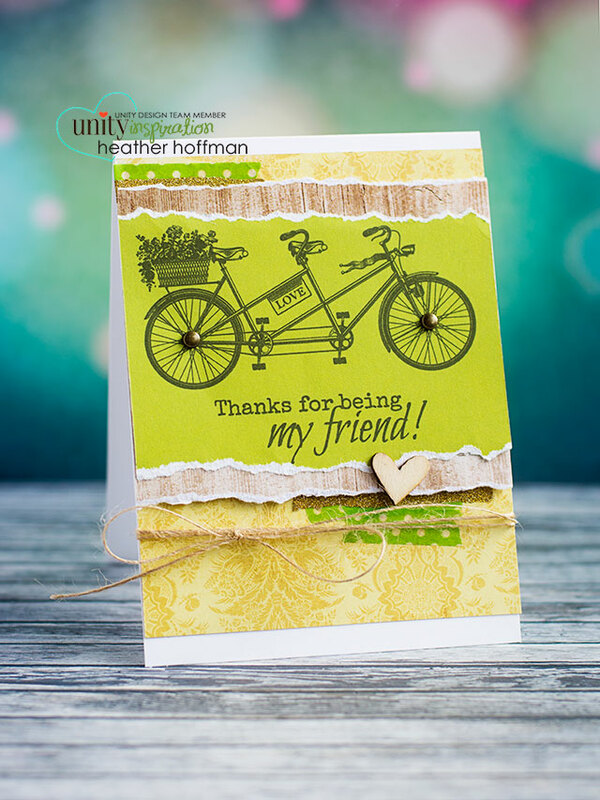 For this one I added some washi and jute twine, a couple of little brads to the centers of the bike wheels, and some torn edges for texture. These next ones are all the same layout and design, just different colors, and using the 3 different stamp sets - they are all so beautiful!!! 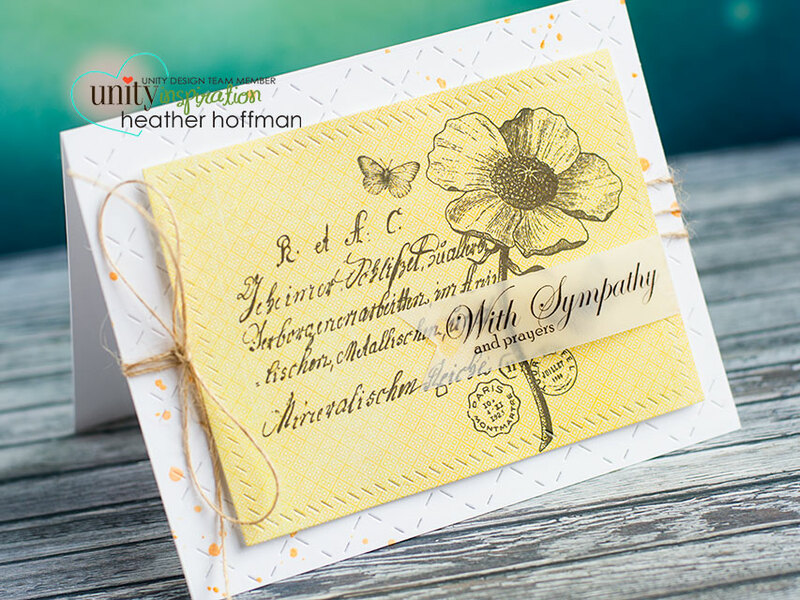 This one is a yellow color scheme - a little Heidi Swapp Color Shine splattered in the background. 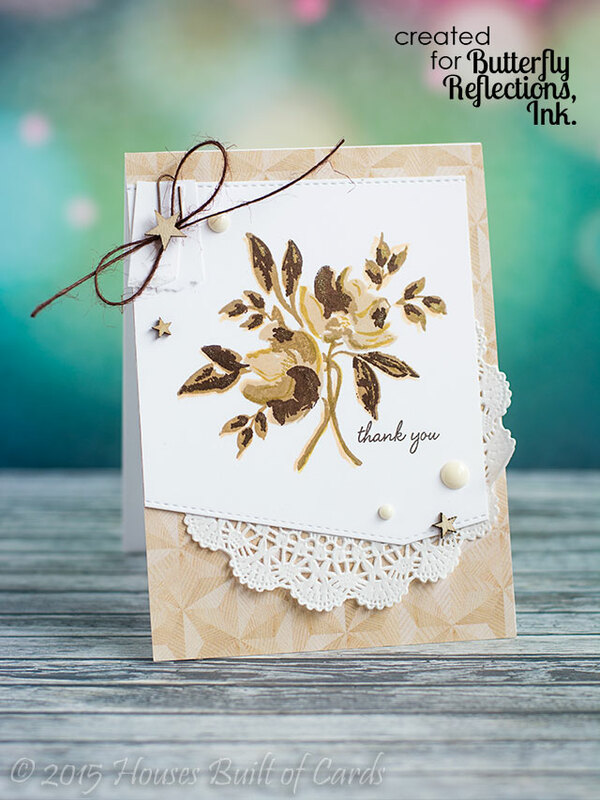 I used Lil' Inker's Quilted Stitched Pattern Die for the white base - love the bit of texture it gives, while still keeping it clean and simple. All the center panels were cut with Lil' Inker's Stitched Mats: Side-Stitched Rectangles. 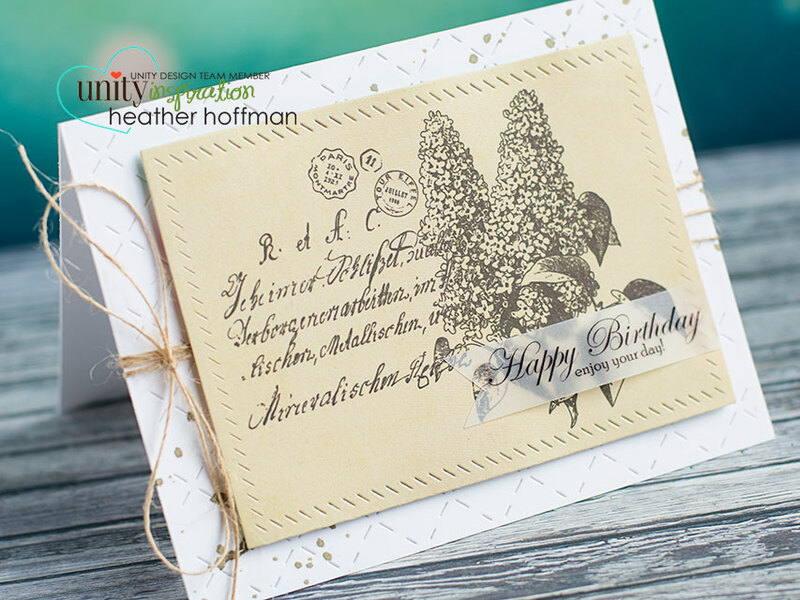 I added the sentiments on vellum, making a hand trimmed banner, and finished off with some jute twine tied around the card. And of course, make sure and check out the amazing sales to go along with the new releases - not to mention the beautiful new website! It even has a wish list feature - something that has been asked for by so many people for so long! 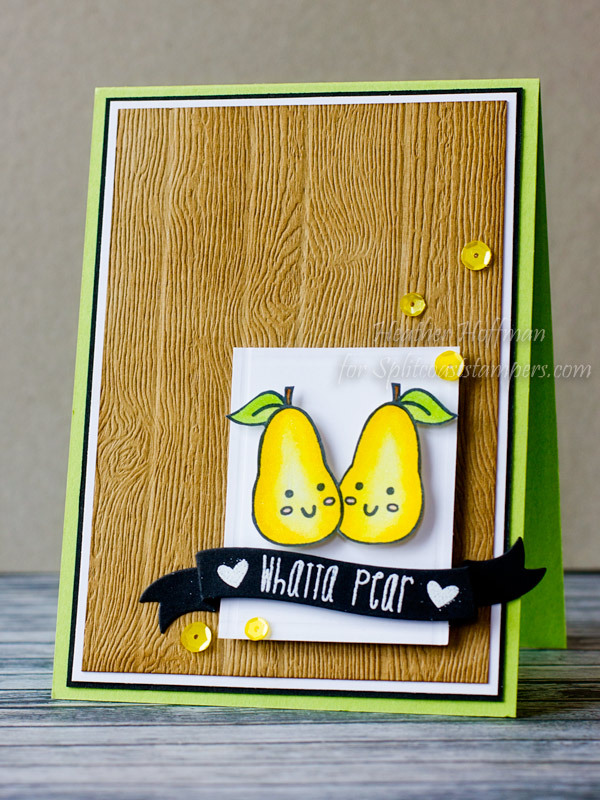 This card used an older (I believe now retired) set from Sweet Stamp Shop - colored with Copics and fussy cut out. The sentiment was heat embossed on a banner die cut with a Simon Says Stamp die. Used some woodgrain cardstock, scored some lines in it to give it the feel of wood planking a little, and inked the edges and selectively over the top with distress ink. Hard to see in the photos, but the pears are also coated with Wink of Stella! Finished off with a few yellow sequins. Good morning everyone! I'm posting this morning on the Butterfly Reflections Blog. 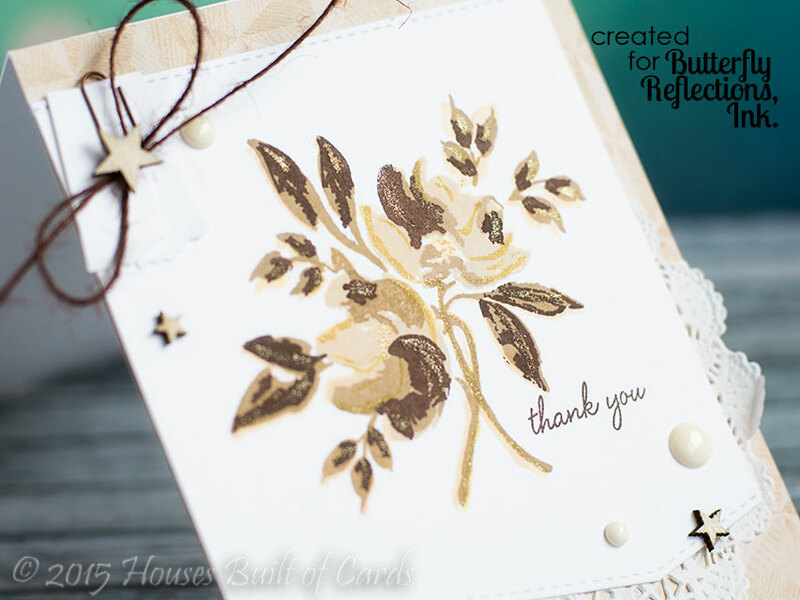 Today I'm sharing a thank you card with a vintage feel - or at least that is what I was trying to accomplish! 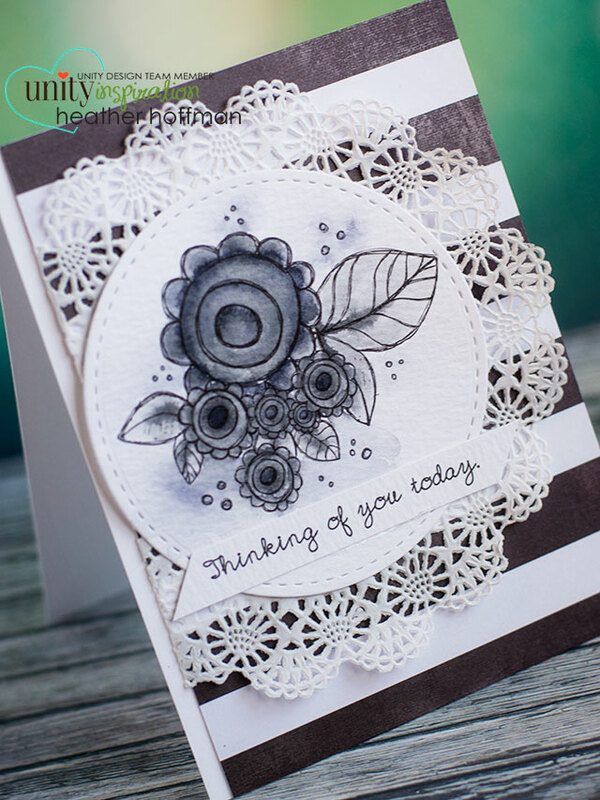 There is something so fun and simple about a monochromatic card! 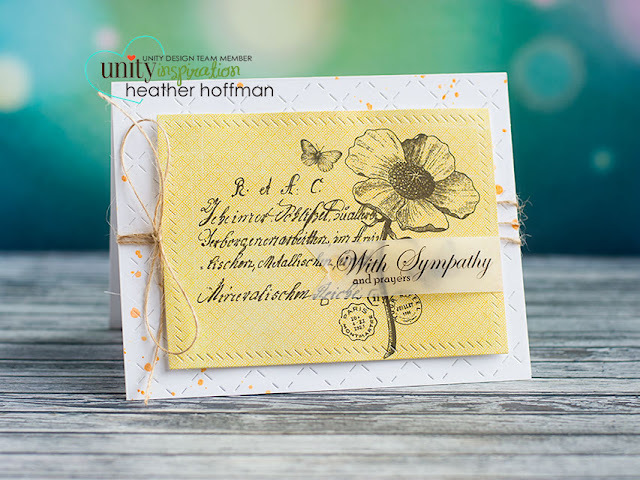 I used the new Wplus9 Watercolored Anemones stamp set - another favorite of their newest release! I stamped it in various shades of neutral brown tone MFT ink, then die cut the panel borders with MFT's Die-namics Stitched Basic Edges and the sentiment which came from Party Animal. 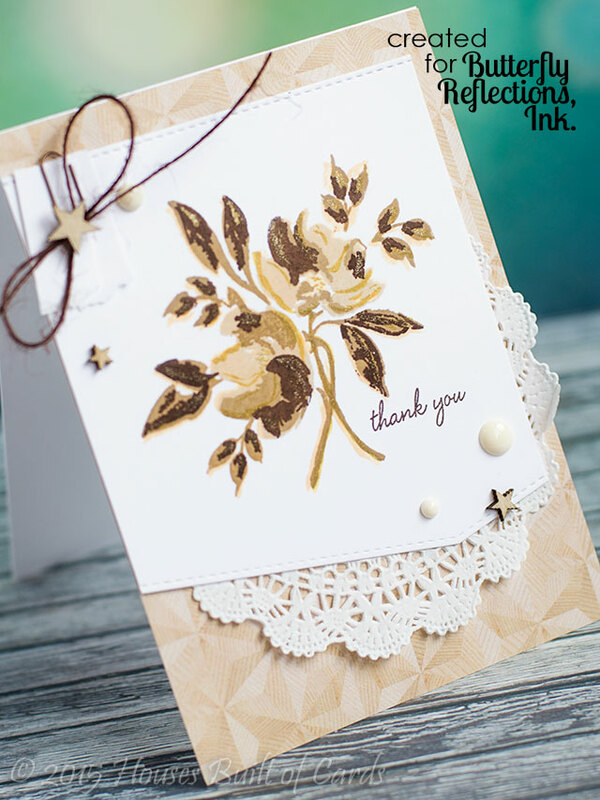 Added some pattern paper from Crate Paper's 6x6 Poolside paper pad and tucked a doily behind. 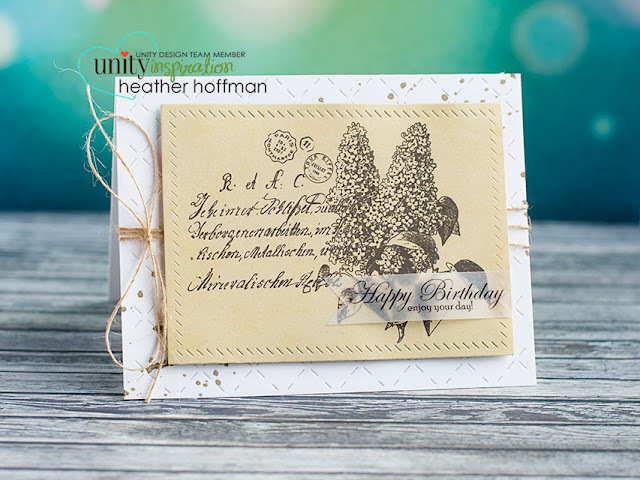 Added a couple strips of white cardstock with torn edges held on with a paper clip and tied with some jute twine, then a sprinkling of Studio Calico Wood Veneer Stars and white enamel dots. As a final finishing touch, I added some shimmer with a Gold Wink of Stella Marker. Hard to see in the photos, but shows up a tad better on this picture - I hope! Good morning! 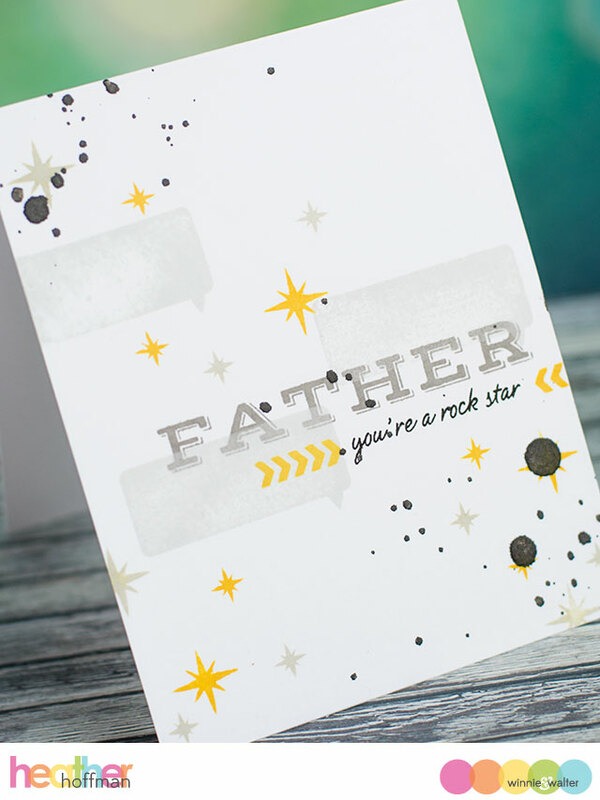 I'm posting over on the Winnie and Walter blog this morning to share a simple card for Dad - just in time for Father's Day this Sunday! Good morning! 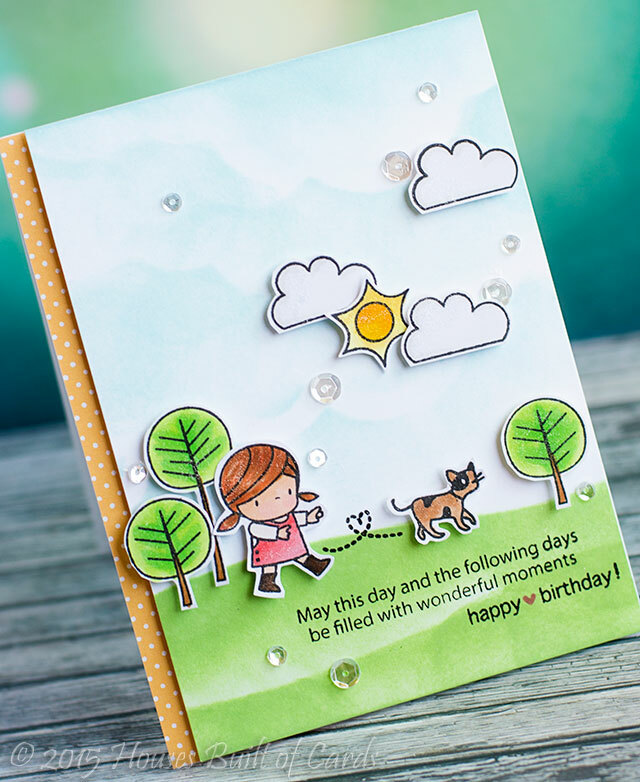 Back again with a full reveal of the cards I made as a Guest Designer for Top Dog Dies with their brand new release! 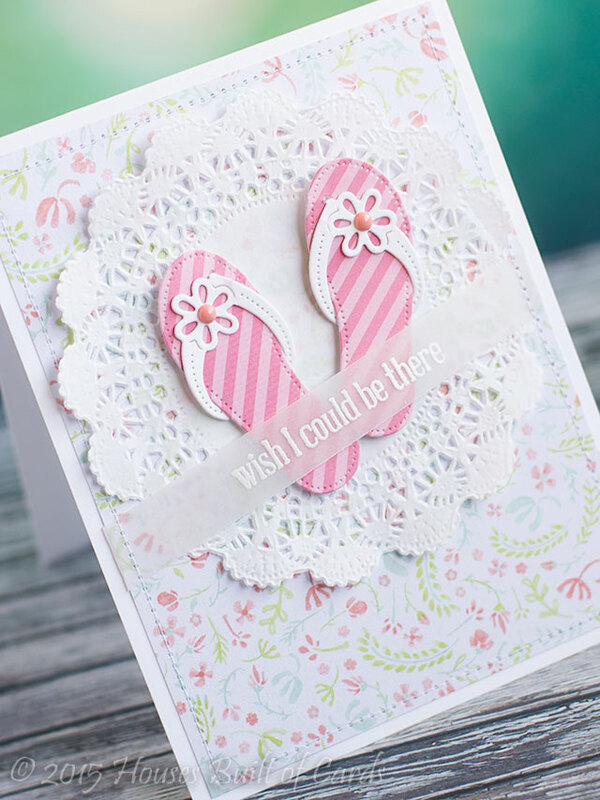 The first set that caught my eye was the darling flip flops – so fun and summery! I die cut these using some white cardstock and pink stripe pattern paper. I used a paper piercer to cut a tiny hole in the bottoms to push the tip of the flip flop through – just adds a touch of realism to them I thought! Added an enamel dot, then adhered them with foam adhesive to a doily, and onto my pattern paper. Finished off with some machine stitching around the edges, and a sentiment heat embossed on white and wrapped around the front panel before adhering to my card base. 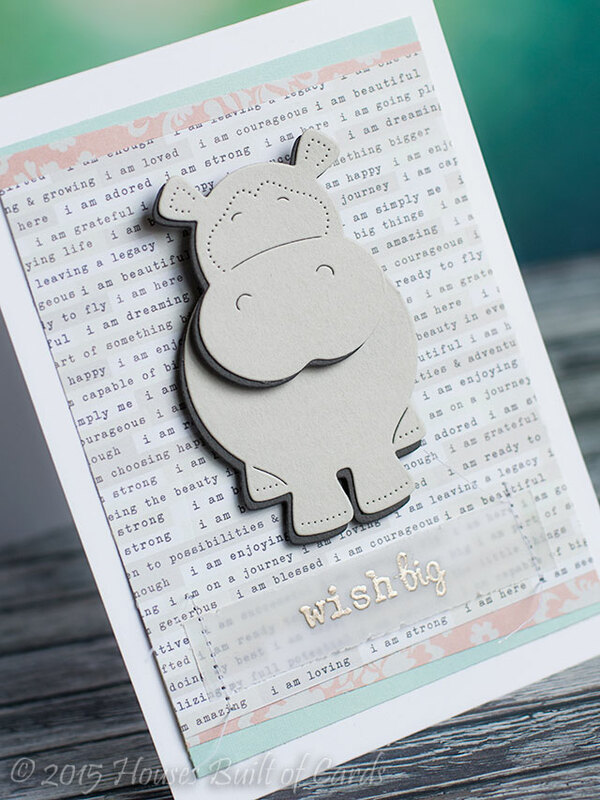 Next up, I just had to play with that darling hippo! SOOO cute! I die cut him from two shades of gray cardstock, and adhered them together for a slight shadow effect. Layered some pattern papers together, stamped a sentiment (again heat embossed on vellum) – then machine stitched it on and attached the hippo in layers with foam adhesive for lots of dimension. And finally, the Snail Die set looked like a perfect set to create a little scene with! For this one, I did some watercoloring on a piece of watercolor paper, then die cut the pieces out of the appropriate colors. 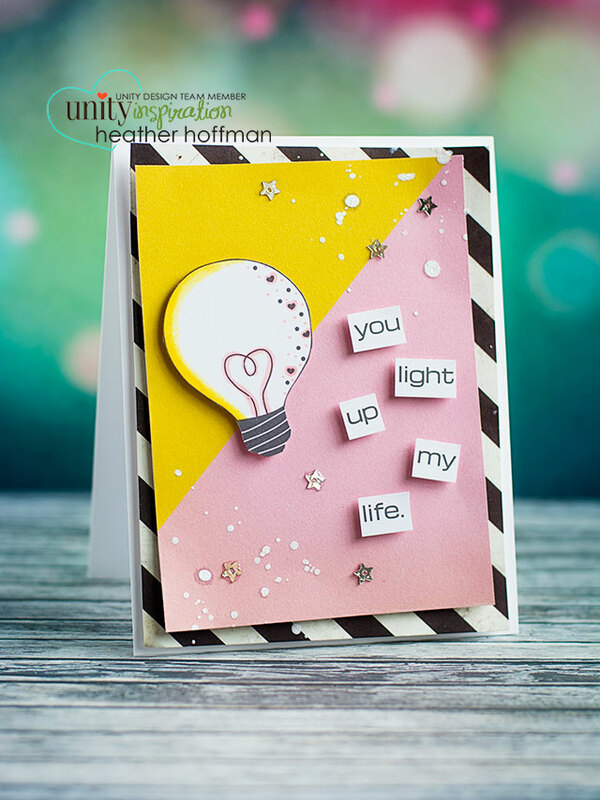 It’s a great way to get die cuts in the exact colors you want! 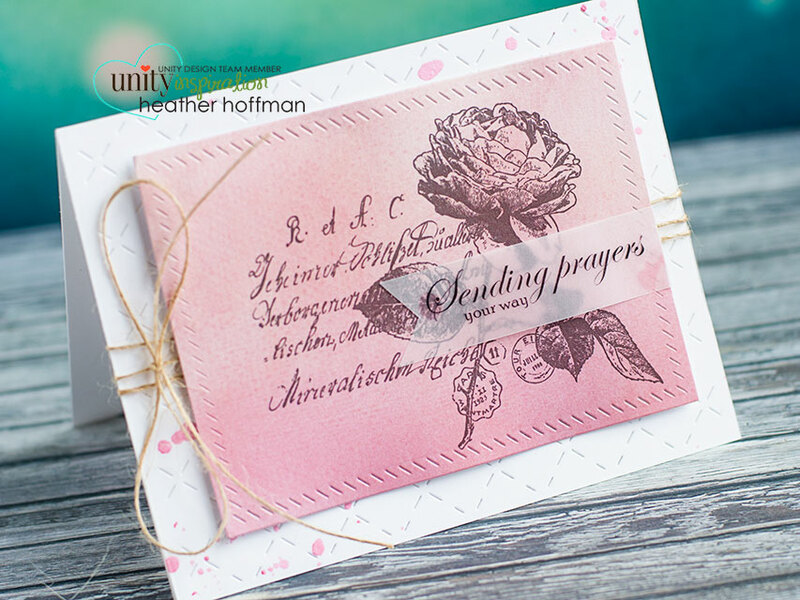 Added some torn vellum to ground the images – and stamped and heat embossed my sentiment on it. 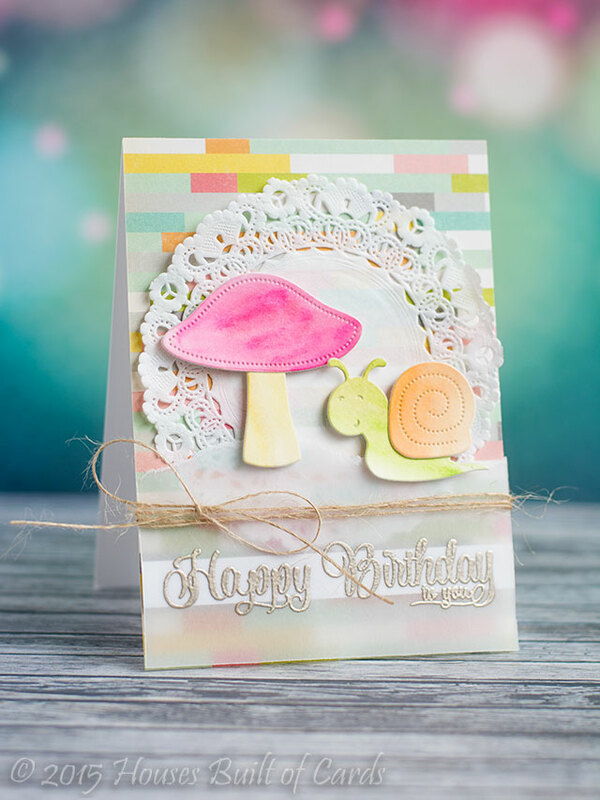 A bit of pattern paper, a doily, and some jute twine finish this off – and then the mushroom and snail attached with foam adhesive! Thanks so much for stopping by today! And thanks Top Dog Dies for the fun opportunity to play with your new dies! Have a great day!!! 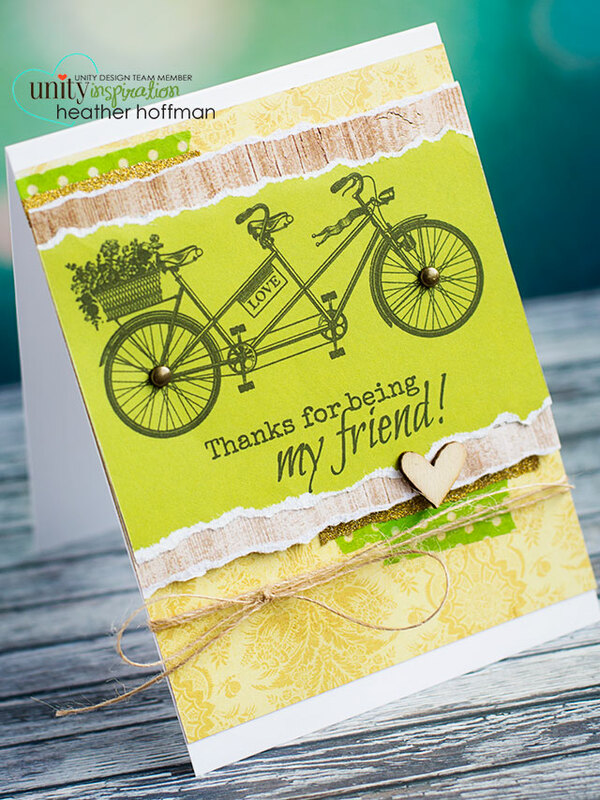 I used some Lil' Inker Designs stamps and dies to put my card together. In hindsight, I wish I had masked between each color for a cleaner line, instead of blending it together. That green between the blue and yellow is driving me nuts! But with an upcoming trip, I just didn't have the time to fix it! I stamped my patter using Really Rosemaling Stamp set, then die cut the panel with Dual Dotted Rectangle Dies. Blended MFT dye inks with a blending tool, stamped the sentiment on vellum and heat embossed, then folded it around. Added a few angled strips of cardstock behind, then mounted with foam adhesive on a white woodgrain cardbase. Good morning! I'm delighted this month to be guest designing for Top Dog Dies, with their own line of steel dies! 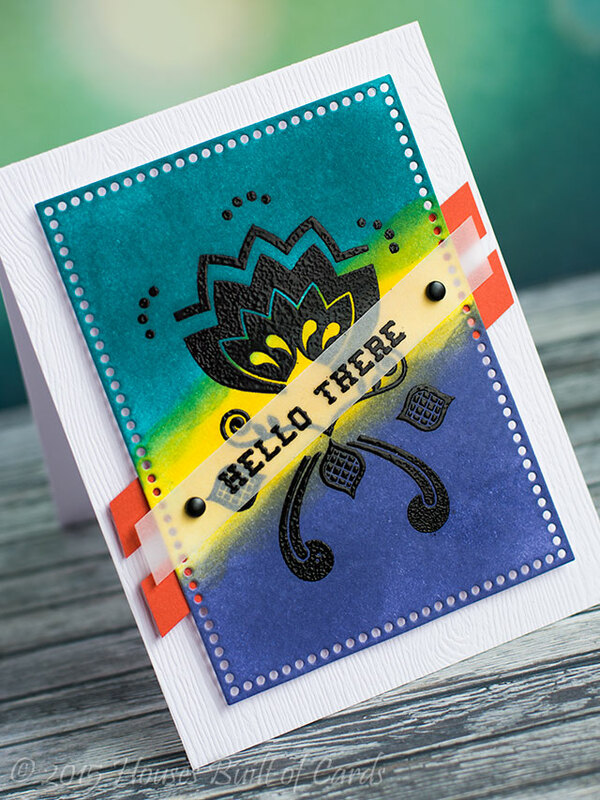 Here is a sneak peek of one of the cards I made with the new release - I'll have a more detailed post in a couple days, but make sure and head over to their blog and check out the new dies! Good morning everyone! I'm posting this morning on the Butterfly Reflections Blog this morning. 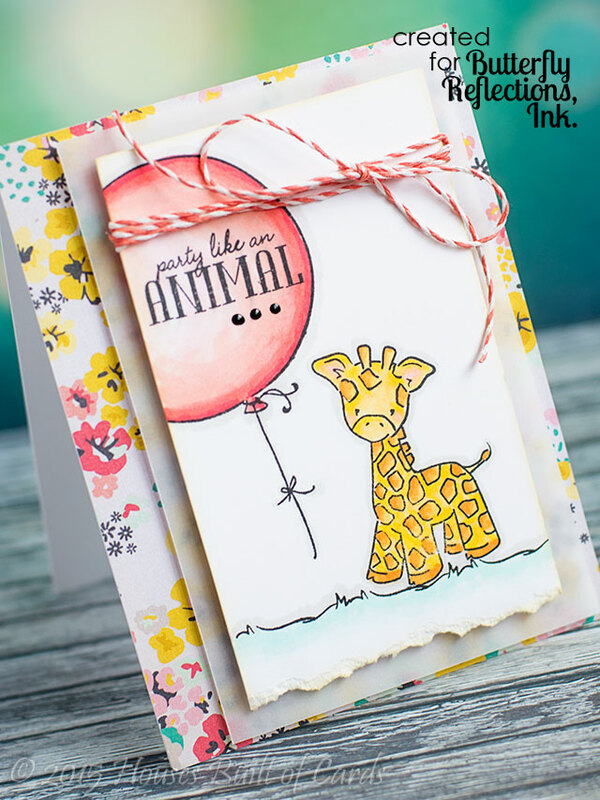 I totally have a thing for cute little critters, so as soon as I got the first sneak peek of the new Party Animal Stamp Set from Wplus9, I knew I had to get my hands on it! Thanks to Vanessa's amazing shipping - I had it just a couple days after it released, and was able to make this! 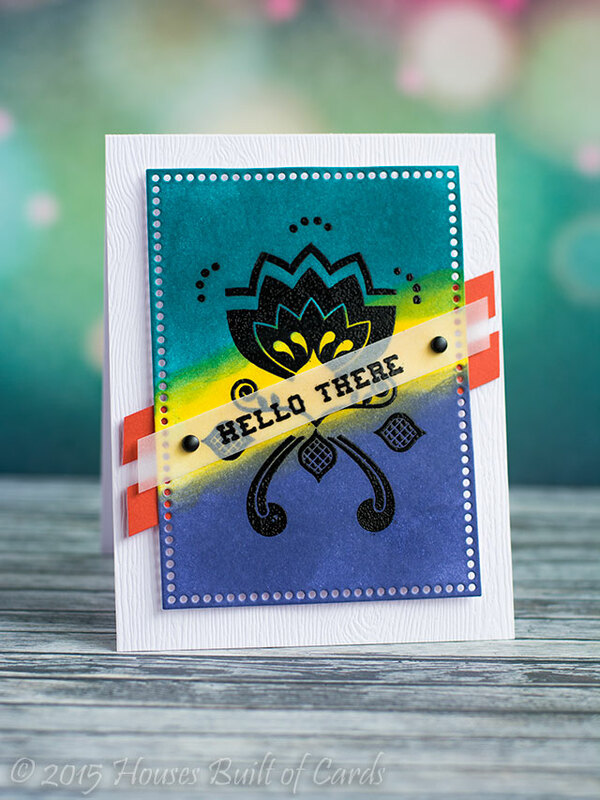 I stamped all the layers with MFT Black Licorice Hybrid ink pad - and colored it in with Copics - especially coordinating it with some pattern paper from the newest Crate paper 6x6 pad - Poolside. Added some Coral Lawn Trimming on the top, a little distress ink along the edges to soften the color, and then layered with vellum and onto the card. Good morning! 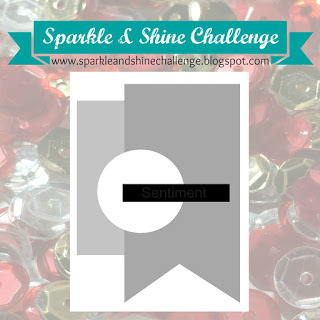 It's time for a new challenge over at the Sparkle and Shine Challenge Blog - this week we have sketch challenge, and a prize sponsored by Winnie and Walter! I pulled out a Lawn Fawn pattern paper pad to build my layers, and used Winnie and Walter's Bubble Talk set for the speech bubbles, stamped on pattern paper and fussy cut out. I also used that set to stamp and heat emboss my sentiment on the banner. 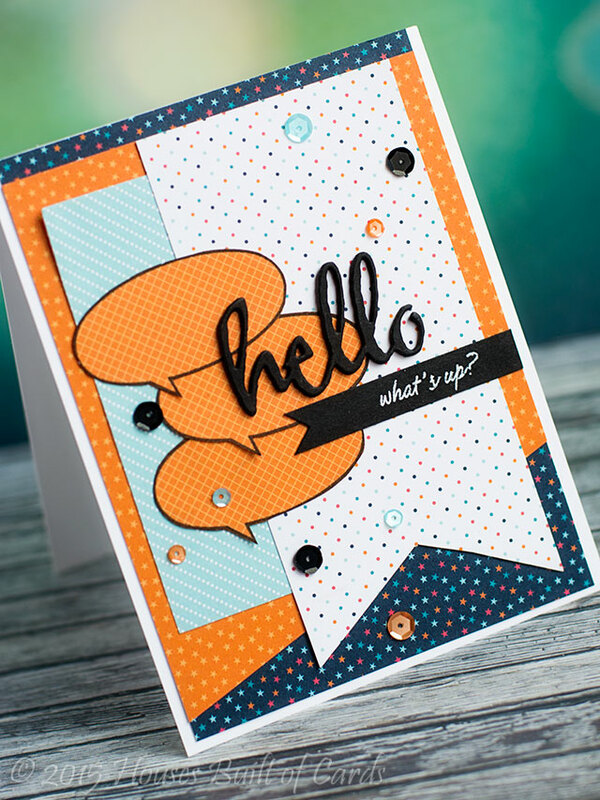 I die cut hello from The Big, the Bold, and the Happy 4 times, and layered them together to make a nice thick embellishment. Finished off with some Tangerine, Aquamaring, and Onxy sequins from Pretty Pink Posh. 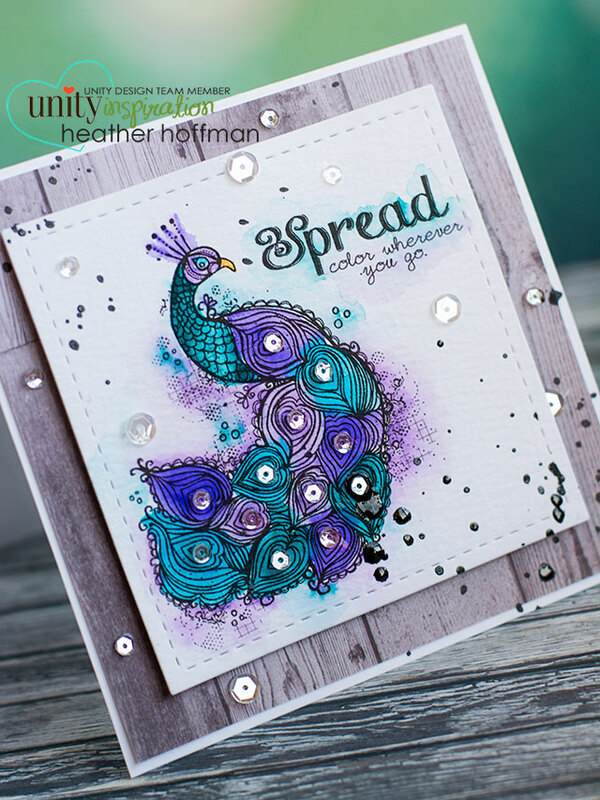 This one uses the beautiful Pretty as a Peacock set - I die cut it with Lil' Inker's Stitched Square Mats after watercoloring, and mounted on Crate Paper pattern paper. Added a bunch of Pretty Pink Posh crystal clear sequins, and a few splatters with some Heidi Swapp Color Shine. This set called Blossomy Condolences is lovely and so versatile! You can do it like this in black and white, or go much more vibrant and fun. 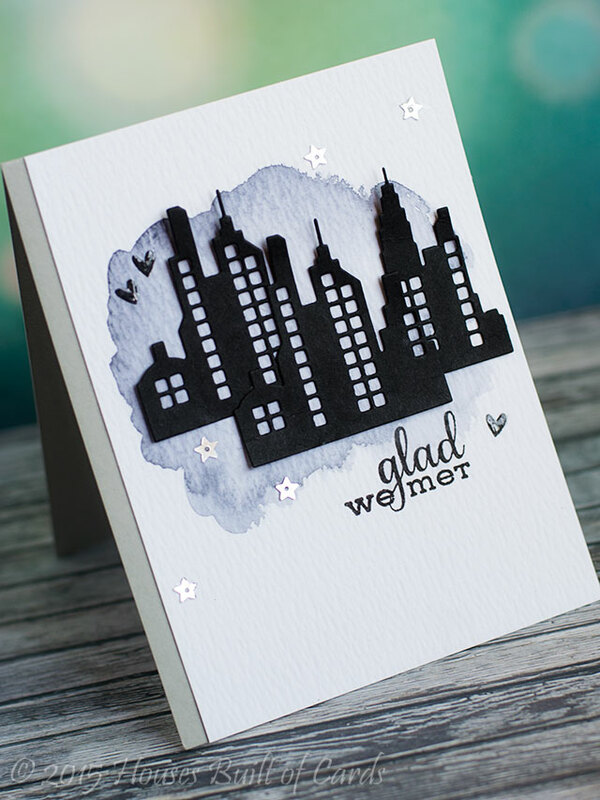 I watercolored it with different shades of gray, then die cut it with Lil' Inker's Stitched Circle dies. Added a doily, and some American Crafts pattern paper to finish it off. 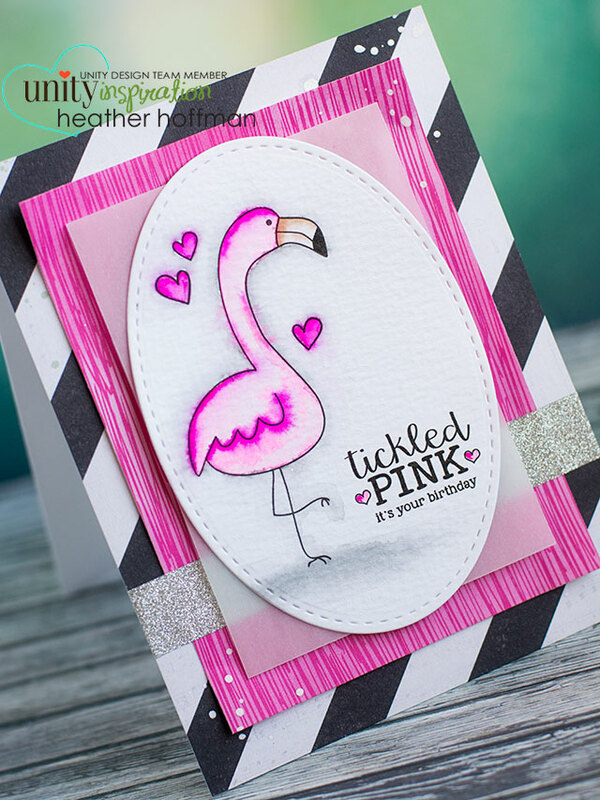 Finally - isn't this flamingo the CUTEST?!?!?!? 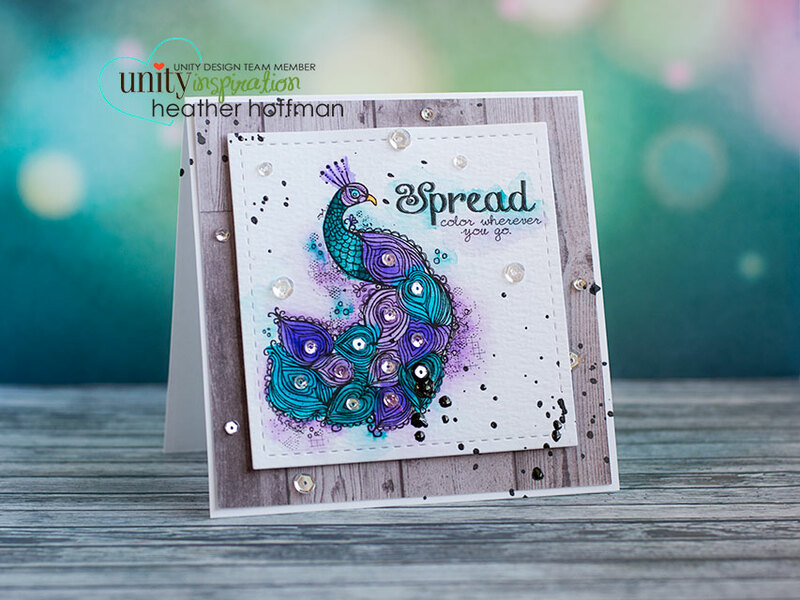 This one used Let's Flamingle - colored again with watercolors, used a Stitched Oval die from Lil' Inker's, some pattern paper from American Crafts and Crate Paper, a touch of vellum and glitter washi, and some white Mister Huey's mist to finish it off. Unity Hop - Smile It's Your Day! 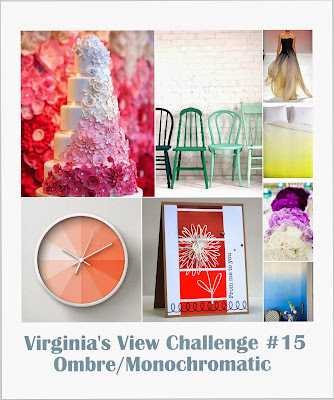 Runway Inspired Challenge - Exciting news!